This module allows you to put a countdown timer on your site along with a message. The countdown then will appear at the top of all site pages. Multiple countdowns at a time are supported. Two possible styles - plain text and flip-like. Three different sizes - small, medium and large. 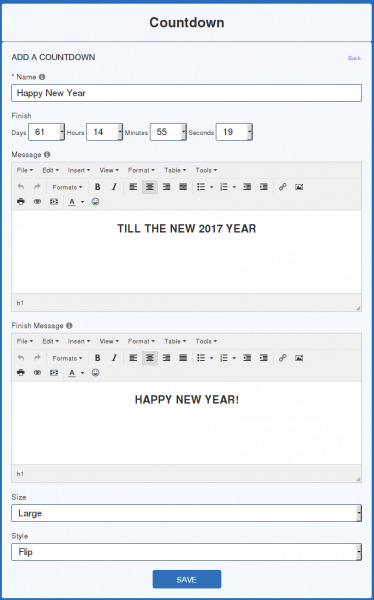 Optionally can have a "finish message" - a message that will appear in place of a countdown as soon as it will finish. Great module, extremely easy to Install and Operate. Places the Timer at the Top of ALL web site pages. Perfect for any promotion or event.